Admiral Sir Edward Codrington GBC RN (1770-1851) was not one of Nelson’s original Band of Brothers – the captains who fought under him at the Battle of the Nile – but he certainly belongs in the broader Band. He commanded HMS Orion heroically at the Battle of Trafalgar, went on to become Captain of the Fleet, fighting the Americans, during the War of 1812 and later defeated the combined Turkish and Egyptian fleets at the Battle of Navarino. So it’s no wonder that there should be a London pub named after him – the Admiral Codrington on Mossop Street, a quiet backwater around the corner from the posh Chelsea neighbourhood of Sloane Avenue and Draycott Place, home to Daphne’s and Bibendum and other renowned and ludicrously expensive eateries. Many a London pub has closed its doors in recent years; others have struggled to reinvent themselves as restaurants. “The Cod” does so with distinction, retaining the proper ambience of a pub in the bar while adding on a long dining room at the back, decorated in a cheerful but dated 1990s style and featuring (who knows why?) a retractable glass roof. The roof was closed recently when I had dinner there with my daughter and her fiancée and we sat in a comfortable green velvet booth and told each other outlandish stories. I was impressed with the service and with the food. The menu is eclectic but nothing we ordered was anything less than excellent. I started with tender squid rings that had been deep-fried in a crisp, robust, fish-and-chip-style batter then smothered in finely sliced green chilies and chopped scallions and strewn with coriander and salt. The scrunch of batter and the tongue-tingling hit of chili proved distractingly pleasurable. Clams can so often end up like little nubbins of India rubber snipped from the blunt end of a pencil – especially those tiny palourde clams that usually meet their maker as spaghetti vongole. The Cod, however, steams them to a becoming tenderness and piles them in their shells into a bowl of lightweight but intensely flavoured broth featuring flecks of smoked bacon, chopped shallots and fresh, sliced sage. It’s heavenly, slicked up with a final knob of butter and, but for the necessary work of extricating the clams, the whole thing would be gone in a trice. 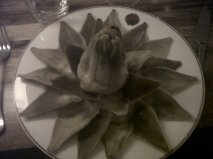 I don’t often see a whole globe artichoke on a menu – certainly not in February – but we ordered it and were not disappointed. The picture gives some idea of the attractive presentation – outer leaves pulled off leaving the heart like a conical alien bloom. The kitchen serves it with a thickly emulsified vinaigrette for dipping and a deliciously stiff walnut aioli. And I couldn’t resist seeing how they did a Welsh Rarebit. Pretty good, was my verdict – nicely seasoned with Worcestershire sauce, the melted cheddar rich and bubbling on crusty brown toast though there was too much Dijon in the recipe… Ah, but my WR standards are impossibly high having been set long ago by my Grandmother’s impeccable version. Mains took matters to a new level. I had the Cod’s cod – a big fillet of moist white fish that parted into juicy petals at the touch of my fork. The fish had been thrice coated – once with a layer of tomato purée, then with a waistcoat of mushroom duxelles and finally with a green blanket of breadcrumbs, parsley, thyme and grated parmesan that held together under the heat. A most accomplished dish. Grilled Dorset lamb cutlets were the cod’s equal – the meat good and lamby with a sweet layer of fat and the proper, slightly chewy texture that speaks of actual grazing in green pastures. A gratin of very thinly sliced swede reminded me how much I love the flavour of that particular root (we call it rutabaga here) while caramelized onions and salty little capers completed the dish. Desserts are usually worth waiting for when you eat at a pub – definitely so here. Sticky toffee pudding was almost too sticky, almost too buttery and too thoroughly drowned in toffee – almost. Vanilla panna cotta was as rich and slippery as a Russian billionaire. You can find the Admiral Codrington at 17 Mossop Street, London SW3. 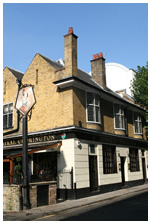 020 7581 0005. www.theadmiralcodrington.co.uk. I love The Cod! Great fun to see it on your site, James! How do you know it, Malcolm? It is fun, isn’t it. I’m organizing some dinners there during the Olympics for friends of Gold Medal Plates.